WHAT IS SUMMER SWIM LEAGUE? 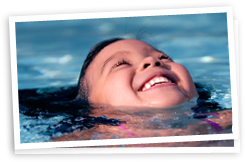 Summer Swim League is an extension of the RIO Swim Club (EVO’s competitive swim club) and is designed for children of all ages and abilities. PRIOR EXPERIENCE IS NOT REQUIRED, however, we do require a quick evaluation of skills for group placement (see group descriptions below). Sign up for our monthly newsletter to receive news, updates and special offers.